2/13/2014Share this story on Facebook! The Ithaca College School of Business Business Link Professions program hosts networking trips throughout the semester. During the 2013 trip, marketing and international business students had the opportunity to visit companies such as CBS Consumer Products, Facebook, G2 Worldwide, Macy’s, and Madison Square Garden Company. Following these site visits, there was also a networking reception held for the participating students and IC alumni in the area. Read about the trip here. During the spring 2013 semester, Sarah Flade ’14 attended a two-day networking trip in New York City hosted by the Ithaca College School of Business. As part of this trip, Flade had the opportunity to meet with alumni and visit major finance and marketing companies. Though she didn’t know it at the time, it would ultimately lead to her first job after graduation. “Ithaca College has such a great alumni community that are extremely willing to help out. Because we are a small, tight knit community, fellow Ithacans root for each other,” Flade said. She learned this firsthand at the networking reception when she met IC alumna Kelly McNamara ’05, a senior auditor at MasterCard. Flade and McNamara were able to bond over all things Ithaca and formed a valuable connection. After she returned to Ithaca, Flade followed up with McNamara for a summer internship opportunity. Shortly after she interviewed and was eventually offered a paid internship at MasterCard in the Digital Solutions department in Purchase, N.Y. In this role, Flade researched marketplace trends and examined specific digital solutions at other banks. She met with other departments, including marketing, development, and legal to gain insight on how to develop digital product solutions for MasterCard. At the end of her internship, she was invited to pitch her final presentation to the company, about connecting with credit unions through webinars. “I really felt like a full-time employee at MasterCard. Once I got up to speed and trained, I was working with the rest of the employees, attending meetings, and even running them,” Flade said. Outside of the office, Flade was invited to company social gatherings and volunteered with MasterCard during a day-long Habitat for Humanity build. She’d been involved with Habitat for Humanity since her freshman year at Ithaca and has served as volunteer coordinator and now vice president of the IC chapter. “I definitely went into this internship with project management, teamwork, and communication skills that I gained inside the classroom at Ithaca, as well as leadership skills from campus organizations [like Habitat],” Flade said. Her charitable efforts were featured in a MasterCard video showcasing the philanthropic causes company employees engage in. At the end of her summer internship, Flade was invited to interview for a full-time, salaried position in the two-year rotational program in the same department. 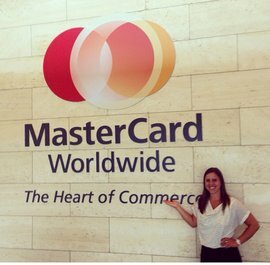 In mid-October she received a full-time offer with MasterCard as an associate analyst. She’s set to begin her job in the summer of 2014, after she graduates from IC.